Jon, for what it´s worth; I enjoy reading your posts and, even though I am not nearly as educated as you, I share your views. I also think it´s worth saying that most of us see how some twist your words, opinions and reasoning and put statements in your mouth you never expressed. So, please continue. The only way to stretch Canon is to be vocal about what we want them to deliver. A fanclub praising anything they do does not help! I have a photography friend with a D810 and we hike together, shooting much of the same. My high ISO shots are better than his. But the majority of what we do is low(er) ISO and my 1DX/5DIII is nowhere near the IQ he gets from the D810. Yes, I have some lenses he can´t use on the D810, but we have pretty much the same Zeiss collection, which takes lenses out of the argument. I´ve negotiated a price for a Pentax 645z package, but I hesitate to order, because I really don´t want to drag two camera systems around. But unless the 5Ds or the 5DIV proves to be better than I currently believe, I´ll go for a split system. I´ll get the next 1DXII for my long whites, but I´ll convert the rest. Yes, it is a drop in the bucket. I realise that. I have always wanted to do astrophotography. All I have done so far is a few star trails a few "starry starry night" shots and some moon shots. I do want to shoot the Andromeda Galaxy (before it hits us ). Buying the software will be a first step. I think I will need a mount next. I will stick with my 5D3, 7DIi, the 100-400L and the 70-200L for now. Thanks for all the input. Your posts are always informative. Thank you. Seriously awesome shots! I thought I had a lot of patience waiting for some of the critter shots but nothing like that. Would probably be willing to try something like that if I could find a place with less light pollution. The night a couple of years back the power went out for San Diego and Imperial counties would have probably been great. Here is another. I just had a run of six clear nights...something I've never seen before...and got a ton of data on several targets. Most were galaxies, the one nebula was Rosette. This is an 11 hour integration (164x240s subs). This is my longest integration to date, at 11 hours. I did this from my back yard with an IDAS LPS-P2 light pollution filter. That's replacing my Astronomik CLS filter, and it's actually quite amazing. Not entirely dark site quality data, but quite good data nevertheless. Awesome shot. I prefer the second version. Those photos are the most amazing photos I've seen on this website. My goodness gracious. Here I thought I'd grown a larger manhood cause I just got a 600mm with TC and 6D and you post something that looks like it was shot with the Hubble. I'm gonna need some Viagra. I like the first one the best. 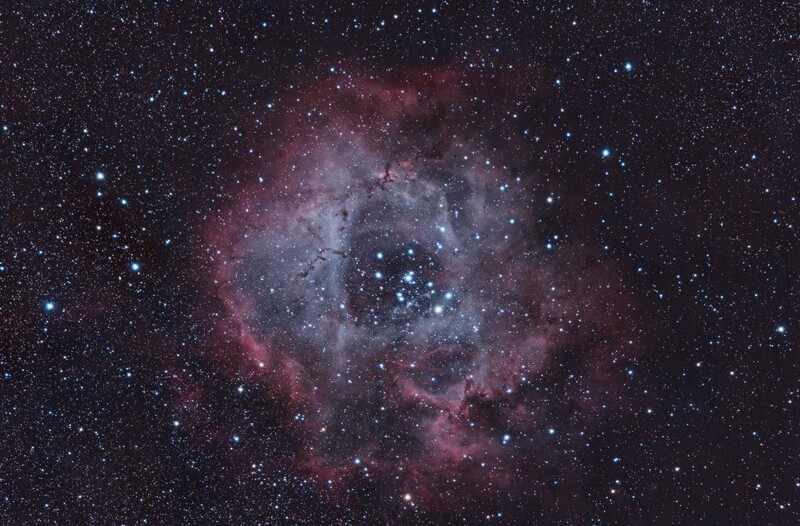 Your Astro images are inspirational and now you've got me wanting to try it. I live next to a small town, its yellow on the dark sky maps but I have a cabin up north, its blue on the maps there. Is that the mount you are using? Can you recommend a tutorial site or books to get started? Candc, that is indeed the mount I have. My mount has also been upgraded with the Rowan Engineering belt mod, which eliminates a number of gears in favor of pulleys and belts. That eliminates a good deal of backlash, makes the mount more responsive, makes it quieter, etc. The belt mod is another $200. I've also hypertuned it, which improves performance. You can get a kit for doing that for $200, or buy the various parts you require yourself for less than $60. Hypertuning requires mechanical skill, a VERY careful hand, and a LOT of patience and time...it's a slow, methodical process, and I don't recommend it unless you really know what you are doing. Both the hypertune and belt mod gave me the performance I needed to get these images. Before them, my tracking was around 2-3" RMS, while my image scale was 1.5"/px. Combined with seeing, before modding my stars were usually 6" or so in size, whereas after modding they are about 2.8" in size. That really matters once you get down to it...tight stars are a key factor in a quality image. I recommend the belt mod regardless of your mechanical skill...it greatly improves the performance of the mount. Regarding getting started in astrophotography, I don't know of any books. I'm a self starter, I have taught myself everything I know my entire life. My knowledge is all based on theory I knew, theory I learned (usually just researching on the internet), practical experience, and trial and error. I am happy to help when I can, but I don't own any astrophotography books, so I can't really help there. I do know a guy who sells CDs for beginners. 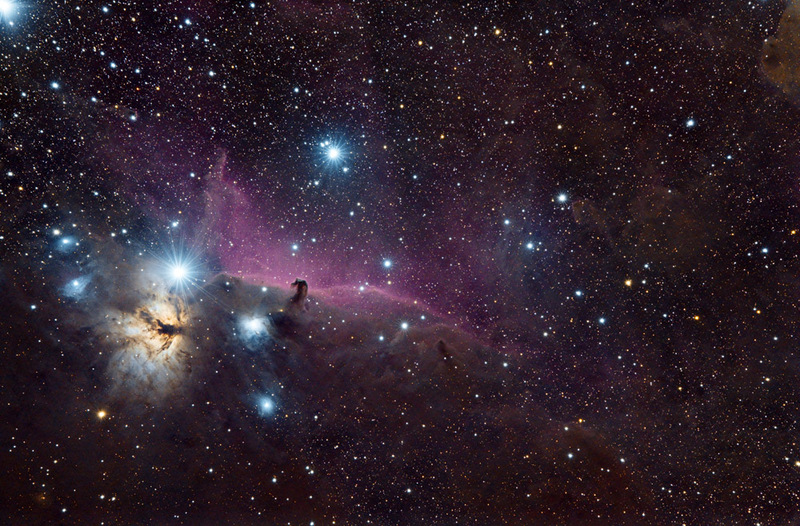 Jerry Lodriguss, astropix.com. You could start there. All in all, it was over nine hours of processing before I was finally finished, and about 14 hours of total processing time. The entire process from start to finish including image acquisition was over 35 hours. On ONE object. I'm not trying to show off here...I just want you guys to understand the level of effort required to make images like these. It is extremely time consuming, requires very dedicated effort, expensive equipment, and both diligence and patience to get through the first six to eight months (which are usually very difficult, as you struggle with all the mechanical and optical and electronic aspects of your gear before you finally learn how it all works, figure out how to keep it all balanced and operating smoothly and guided well and all that). I spent the last year (literally, I started doing astrophotography Feb. 12, 2014) learning how to do all of this, and the images I've shared here are indicative of both the experience I gained over the last year, as well as all the base theoretical knowledge I had going into things. If you love this kind of stuff, love tinkering and fiddling, want to learn a highly technical form of art, then you won't have any problems. 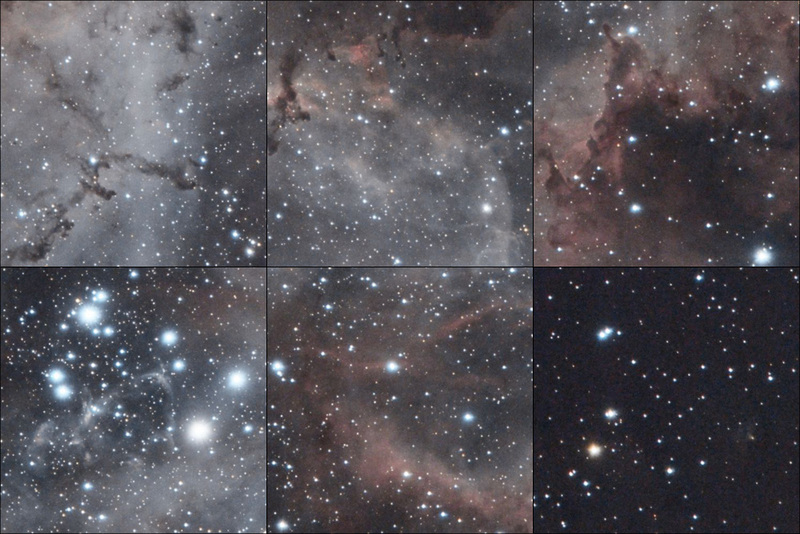 On the other hand, if you think it just takes a night of pointing a scope at the sky, and a couple of hours of processing to create images like Rosette, or the Orion images, I recommend you at least learn more about the hobby before you spend money. Even a very low end mount is $1200-$1500, and that is the bare minimum. I would rather you guys be educated enough to know what your getting into, than to recommend you just dive in and spend a lot of money on a hobby that you may find is not something you want to or have the time to invest a lot of effort into. There are simpler ways of starting as well. You can get a Polari or AstroTrac and use a DSLR with smaller wider field lenses to get amazing images for about a grand. That's a much cheaper way to start, an while it still requires and investment of time, it's not nearly as much as it took to produce the Rosette images I just shared. Thanks for the words of discouragement I expect the dedication it must take and am 100% sure its very frustrating, especially at first but it has to be very rewarding as well. I will do some reading up and decide what level of commitment I am willing to give to the pursuit. I definitely want to give it a go to some extent. That website list's an upgraded version of that mount with a belt drive. Is that similar to the belt drive mod you recommend? Thanks for the advice and sharing your images, its always a pleasure to view them. Yeah, the Atlas Pro is basically a ready-to-go version. It's about $500 more expensive, whereas the belt mod itself is $200. If you have mechanical skill, I would say get the original Atlas and the belt mod, save the $300. If not, the Atlas Pro is a good mount. I'm also not really trying to discourage, just make sure you know exactly what's involved. If you are up for it, it's an awesome hobby, and it is most definitely rewarding. A few recent shots with the 600II -/+ 2XTCIII. I have wondered about the IQ of the combo and thought others might appreciate some real world shots. Wildlife around Jackson Hole and in Yellowstone made good subjects. All images were shot with the 1Dx body and processed using DPP4 + DLO + sharpness of 6 and then processed to lower res JPEGs to post. a few more w the 2X to come. #2 1/1000, f11, ISO800, 2XIII -minimal crop - this one had a focus issue, I think. The file shows the central focus point in focus on the animals neck. Maybe 1/1000 was not a fast enough shutter at 1200mm? I hate I goofed this one b/c this was the closest wolf all week. Overall, the IQ of 600II + 2X III was quite acceptable when the lighting was good (IMO). However, I think I underestimated the shutter speed needed to stop motion of subjects and the combo did not handle back-lighting well (none shown since I already deleted those files before deciding to post this). Today, I decided to buy the EF 600mm f/4.0 L ii, so this afternoon I made a trip to my local vendor and bought the 600ii together with a second 1Dx. Took a while to get to this point. Last year during my safari in Zimbabwe, I mentioned that I used a lot the 560mm of my 200-400 1.4x. However for birds this was not enough. The 784mm of that lens (internal and external 1.4 extender) has only a f/8 aperture with only one focus point. As I am going to Uganda in September, I wanted more reach. So my lensset for that trip will now be the 600 f4.0 ii +1.4x, 300 2.8ii, 70-200 2.8ii, 24-70 2.8ii and the 16-35 f4.0. I hope to get the wildlife further away but also the birds, of which there are a lot in Uganda, wildlife in the equators forest and of course the silverback on the CF card. After my trip I will post some shots over here. Other suggestions for lenses for that trip ? How did you adapt the IDAS filter to your drop-in holder? Did you remove the glass and inserted the IDAS? Did you use a tripod or monopod ?